Now in its tenth year, the annual competition for university students continues to unearth talented future IT professionals, while exposing them to the exciting careers at the bank. 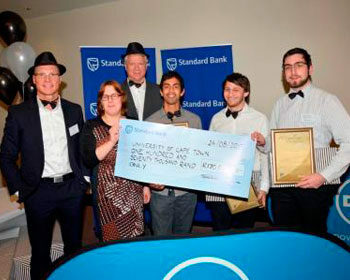 Students from the University of Cape Town (UCT) were named the overall winners at the tenth annual Standard Bank CIB IT Challenge awards evening held in August 2015. This is the seventh time a team from UCT has won the coveted prize. The university was awarded R170 000 in prize money, while the students in the first three teams each received prizes sponsored by Dell. The team from the University of Witwatersrand was placed second and received R20 000 for the university, while the team from Nelson Mandela Metropolitan University came in third place and received R10 000. Supported by judges from the Institute of IT Professionals South Africa (IITPSA), a professional body serving the South Africa’s ICT professionals and practitioners, participants are tasked with coming up with innovative ways of solving programming and algorithmic questions within six hours. The winning UCT team correctly answered six out of nine questions, impressively answering four questions correctly within the first 40 minutes of the competition. The team was also awarded a bonus point for the “best interactive question” solution. The Standard Bank CIB IT Challenge, launched in 2005, is an annual event aimed at university students studying towards computer science qualifications and exposes them to the bank’s IT offerings, while establishing Standard Bank as an employer of choice. The IT Challenge also provides Standard Bank the opportunity to interact with talented individuals worth inviting to participate in our IT graduate programme. “Over the years, a number of employees, past and present, have begun their working career at Standard Bank as a direct result of the IT Challenge,” says Ginny Osborne, coordinator of the IT Challenge. 2014 IT Challenge participant and third place winner Melany Barnes took part in the 2015 challenge in one of the Standard Bank teams. She shared her experience of participating in the competition from her second year at the University of Pretoria and her subsequent employment with Standard Bank. “The IT Challenge allowed me to learn more about the culture of Standard Bank. At the time, I was not sure whether I wanted to be a web developer or a mobile developer, but during last year’s challenge a presentation about Standard Bank’s mobile applications helped me make up my mind. I am now excited to be part of the bank’s mobile development team, and so far the experience has been excellent,” says Melany. The IT Challenge is the brainchild of Mike Murphy, Head: Group Technology Build, who was the keynote speaker on the night. Mike mentioned how difficult it was in the first few years after inception to keep the funding for the IT Challenge going, but how the bank has finally seen the importance of such a competition in grooming the future talented IT employees. Bonus point was awarded for the best interactive question solution.